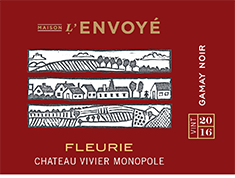 The 2016 Maison L'Envoyé Fleurie is vibrant and expressive with primary aromas of wild berries supported by sweet herbal notes and spice. Layers of mountain strawberry and juicy raspberry are complemented by notes of cinnamon and coriander. Harmonious tannins and a lively acidity carry the flavors to a long, mouthwatering finish.